About time we had something mega, something massive, something magnanimous here- meet India's large herbivores! Worshiped and revered in Indian mythology, the Indian Elephant is the country's favourite and the most iconic animal next to the tiger. The elephant is also India's National Heritage Animal. The elephant is listed as Endangered today owing to poaching, habitat loss and conflicts with humans. The Indian Rhinoceros is the pride of North-eastern India and defines the terai and the marshes along the foothills of the Himalayas that it inhabits. It differs from its African counterparts in having a single horn, and is second in size after the Asian Elephant, in all of our continent. It is listed as Vulnerable on the IUCN, and poaching continues to be the greatest threat to the survival of the rhino. The Gaur or the Indian Bison is the largest ox in the world. The massive animal is easily identified by the convex ridge between the horns on the forehead, and the neat, white socks on the legs. 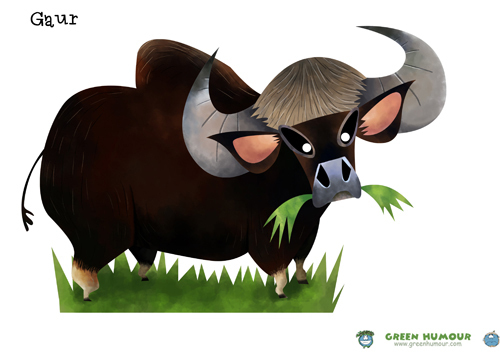 The Gaur is listed as Vulnerable owing to threats from hunting in countries such as Laos and Vietnam, and habitat loss. One of the largest bovids in the world, a majority of the population of Asian Water Buffalo is found in the marshes of Assam. The animal is defined by its large, nearly semicircular horns. 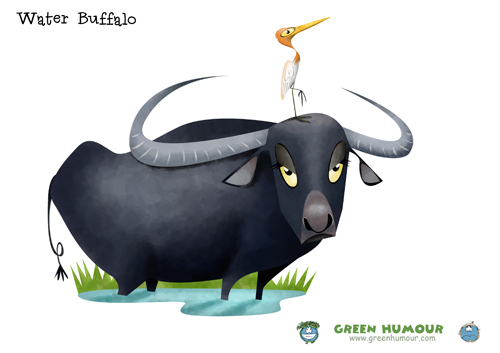 The Water Buffalo is endangered because of interbreeding with cattle, loss of its floodplain habitat, and hunting in countries such as Thailand, Myanmar and Cambodia. The Nilgai (Hindi for Blue Bull) is the largest antelope in Asia and one of the most common ones as well. It inhabits dry deciduous and scrub forests. Sexual dimorphism is pronounced in this species; the males sporting bluish grey coats and a long, coarse hair shaped like a pennant on the throats, while the females are light brown. The Sambar is India's largest deer. Characterized by a uniformly dark brown coloured coat and large antlers on the male, the deer often emits a bark when threatened. Although the sambar is usually solitary, they may be seen in herds, and congregate at salt licks. The Sambar is listed as vulnerable because of poaching and habitat loss. 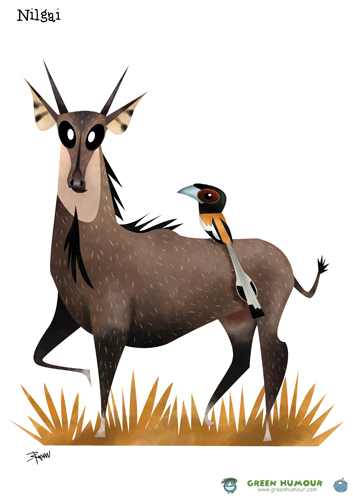 Oh, and two points to you if you name the birds perched on the backs of the herbivores correctly!